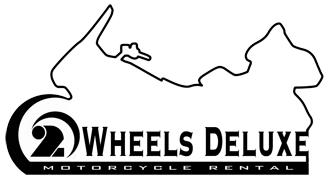 The renter must have a valid motorcycle class driver's license and experience to ride a similar motorcycle with the one rented from 2 WHEELS DELUXE. A rental day is 24 hours. A fee of $25/hour may apply for vehicles returned late. The rented motorcycle must be returned at the time and place specified by "RENTAL OUT" and "RENTAL IN" agreement to avoid additional charges.